On January 28, 2019, Oragenics, Inc. (NYSE:OGEN) announced the publication of new preclinical data for the company’s lead lantibiotic development product, OG716, in the peer reviewed journal Antimicrobial Agents and Chemotherapy. Lantibiotics are a class of peptide antibiotics that are produced by certain Gram-positive bacterial strains. The compounds range in size from 22 to 34 amino acids and typically go through a number of posttranslational modifications that results in novel serine and threonine derivatives, multiple types of sulfhydryl bonds, and the presence of the uncommon amino acids lanthionine (Lan) and B-methyllanthionine (MeLan), from which the lantibiotic name is derived. The compounds are classified based on their length, structure, and heat stability as Type A, Type B, Type IIa, and Type IIb. Type A lantibiotics fall into two subcategories: compounds that are similar to nisin A (Gross et al., 1971) and those that are similar to mutacin 1140 (Smith et al., 2000). Nisin A is produced by Lactobacillus lactis while mutacin 1140 is produced by Streptococcus mutans. The structures of each of those compounds is shown below. Lantibiotics exert their bactericidal activity through a number of different mechanisms, including transmembrane pore formation, lipid II-mediated pore formation, and lipid II abduction from physiological domains. Type A lantibiotics have a net positive charge, and it is believed that an electrostatic interaction between the positively charged lantibiotic and the negatively charged bacterial cell membrane is required for initial binding. In addition, Type A lantibiotics bind to lipid II (a precursor molecule in the synthesis of the bacterial cell wall) and cluster it away from the bacterial membrane where cell wall synthesis is occurring, thus ensuring that not enough lipid II is available and consequently inhibiting bacterial cell growth (Hasper et al., 2006). Mutacin 1140 does not appear to form pores like nisin A, thus suggesting that only sequestration of lipid II is responsible for its bactericidal activity. Vancomycin also targets lipid II, however it is at a unique site away from where lantibiotics bind. In addition, vancomycin does not sequester lipid II from its normal physiological locations (Daniel et al., 2003). Scientists have been aware of lantibiotics for decades, however they have not been studied as extensively as other classes of antibiotics due to the difficultly in producing sufficient quantities of the compounds. As naturally occurring molecules, lantibiotics are usually produced and secreted into a cell’s immediate environment, thus preventing other bacterial cells from infiltrating the area around them. When produced in culture there is a powerful feedback mechanism that works to prevent a bacterium from producing excess lantibiotic that would ultimately kill the host. This results in very low yields of lantibiotics when grown in culture, thus presenting a significant obstacle to their widespread commercial use. Oragenics overcame this obstacle by developing a methodology to produce sufficient quantities of lantibiotics, and through a collaboration with Intrexon Corp. it is developing a means to produce commercial-scale quantities of the drugs. OG716 is a derivative of mutacin 1140, which has good activity against a number of bacterial strains but is not therapeutically optimized (DeFusco et al., 2016). 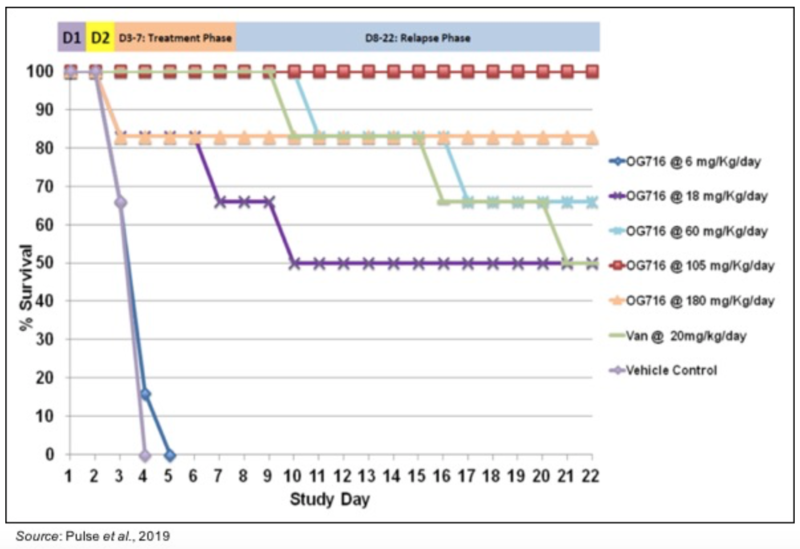 The new preclinical data recently published for OG716 involved characterizing its activity in the Golden Syrian hamster model of Clostridium difficile associated disease (CDAD) (Pulse et al., 2019). As the following figure shows, all treatments using >18 mg/kg/day OG716 resulted in a statistically significant improvement in survival. The ED50 (which measures the concentration of a compound required for 50% maximal activity) was 23.85 mg/kg/day. On a molar basis, this compares quite favorably to vancomycin, which was dosed at 20 mg/kg/day. The ED50 of vancomycin was calculated as 13.8 μmole/kg/day compared to OG716 at 10.97 μmole/kg/day. The researchers found a correlation between survival and both cecal CFU counts and levels of toxins A and B, the major virulence factors of C. difficile (Carter et al., 2010). The following figures show the correlation between A) titer levels of toxins A and B and survival and B) cecal CFU and survival. The data suggest that survival as a result of OG716 treatment is affected by the amounts of toxin and how much C. difficile is present in the ceca of infected animals. Lastly, the researchers determined the maximum tolerated dose (MTD) of OG716, which included a pharmacokinetic (PK) analysis. Doses tested included 639 mg/kg/day, 1000 mg/kg/day, and 1,917 mg/kg/day (639 mg/kg dose 3 times). Following administration of those doses there were no deaths or significant clinical signs noted in any of the animals, except for a hunched posture noted in one animal following a single dose of OG716 at 639 mg/kg that lasted for only one day. PK analysis showed no prolonged systemic exposure of OG716 following doses at 1,000 and 1,917 mg/kg/day. Two animals from the 1,917 mg/kg/day group showed transient plasma elevations of OG716 of 10.3 ng/mL and 13.6 ng/mL. Of note, the lower limit of detection for that assay is 10 ng/mL Given that the molecular weight of OG716 (approximately 2.2 kDa) is larger than the maximum molecular weight for compounds to be able to pass freely through the gastrointestinal wall (approximately 500 Da), it is not surprising that there was very little systemic exposure of the drug even when dosed at very high levels. Overall, these experiments confirm that OG716 has the potential to be an effective treatment for CDAD while also exhibiting an excellent safety profile. The company is continuing additional pre-IND activities and we anticipate an update on this program in the next few months. Oragenics is currently conducting a Phase 2, double blind, placebo controlled clinical trial of AG013 for the treatment of oral mucositis (NCT03234465). AG013 is an oral mouth rinse composed of a recombinant Lactococcus lactis strain that contains the coding sequence for human trefoil family factor 1 (hTFF1), which is continually secreted by the bacteria. The trefoil factor family (TFF) is a family of three different peptides secreted by epithelial cells of the gastrointestinal tract in response to injury (Hoffman, 2004). Their presence has been implicated in reducing chemotherapy- and radiation-induced injury, both in preclinical studies (Beck et al., 2004) and in clinical trials (Peterson et al., 2009). Approximately 160-180 subjects with head and neck cancer receiving chemotherapy will receive either AG013 (2.0 x 1011 CFU) or placebo administered three times a day over 7-9 weeks (depending on the subject’s chemotherapy plan). This will be followed by a four-week follow-up phase with a long-term follow up until 12 months past the end of chemotherapy treatment. OM will be assessed at the start of chemotherapy treatment and will continue until the subject has completed the short-term follow up phase or until OM resolves (WHO score ≤ 1). The purpose of the long-term follow up is to assess whether AG013 has any effect on the tumor response to chemotherapy treatment. In August 2018, Oragenics announced that the Phase 2 trial was resuming following positive results from an interim safety analysis conducted by a Data and Safety Monitoring Board (DSMB) from 19 patients enrolled in the study. Safety was evaluated based on treatment-emergent adverse events, vital signs, weight, physical examinations, clinical assessments, and the presence/absence of AG013 in the blood. The Data Safety Monitoring Board (DSMB) concluded that the trial can continue with no changes to the study protocol. The incidence of adverse events between AG013 and placebo-treated patients was the same. Reports of serious adverse events were typical for a population of head and neck cancer patients undergoing chemotherapy and there were no reports of sepsis or bacteremia. Of particular note is the fact that only a few patients discontinued due to the development of severe OM, which could be an early indication of efficacy. In October 2018, the company announced that it received clearance from the Belgian Health Authority to enroll Belgium residents in the Phase 2 trial and in November 2018 the company announced that it received clearance to enroll patients in both Germany and the United Kingdom. The addition of these clinical trial sites should facilitate enrollment of sufficient patients in the Phase 2 trial of AG013 such that the trial is completed in 2019. We value Oragenics using a probability adjusted discounted cash flow model that takes into account future revenues from AG013 and OG716. For modeling purposes, we anticipate AG013 entering a Phase 3 trial in 2020, an NDA filing in 2022, and approval in 2023 in the U.S. and Europe, with approval one year later in Japan. For OG716, we forecast for clinical trials to start in 2019, an NDA filing in 2023, and approval in 2024. There are approximately 700,000 newly diagnosed cancer patients in the U.S. that could potentially develop OM, with another 1.3 million in the E.U. and 20,000 in Japan. Patients who develop OM currently have few treatment options available to them outside of palliative care. We believe that a successful treatment that both prevented the incidence of OM and also decreased the incidence of severe OM in those that develop it would be very appealing to oncologists. An effective OM therapy could also decrease rates of hospitalizations for patients suffering severe OM and limit the need to decrease or stop therapy. We use a very conservative 5% peak market share, an average length of use of 60 days, and a cost of $100/day in the U.S. ($70/day and $75/day for the E.U. and Japan, respectively) to arrive at peak worldwide sales of approximately $350 million. Using a 13% discount rate and a 40% chance of approval leads to a net present value of $183 million. For OG716, we estimate peak market share of 10% of the approximately 500,000, 200,000, and 100,000 C. difficile infections each year in the U.S., E.U., and Japan, respectively. We estimate the cost of treatment of $3,000, $2,000, and $2,250 for the U.S., E.U., and Japan, respectively. This leads to peak worldwide revenues of approximately $275 million. Using a 13% discount rate and a 25% chance of approval leads to a net present value of $14 million. Combining the net present values for AG013 and OG716 along with the company’s current cash position, potential cash from warrant exercises, and estimated cash burn leads to a net present value for the company of $185 million. Dividing by the fully diluted share count of 41.1 million leads to a current value of $5.00 per share.